Click on an image to open a larger version. 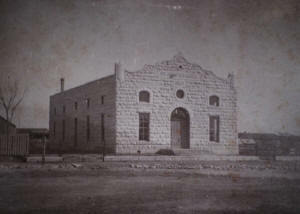 In 1898 the men's society of St. Mary's Parish, St. Joseph Society, built the Halle as a gathering place for the parish, school, the community and themselves. Over a century later their successors committed themselves to restore and renovate this historic building. 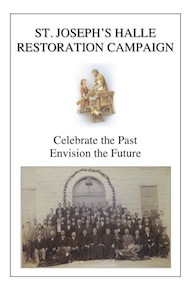 The theme for this effort is "Celebrate the Past – Envision the Future." 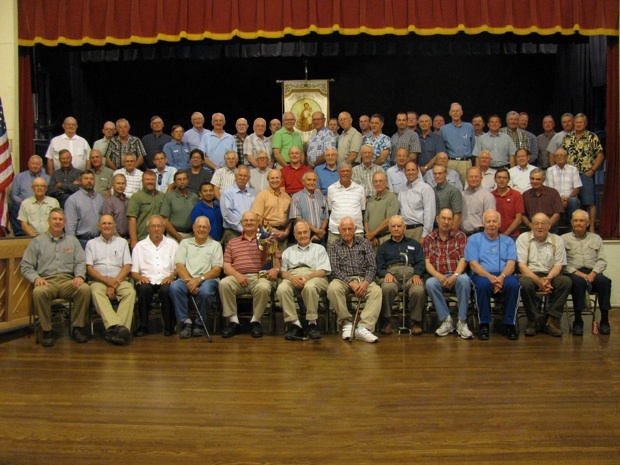 In celebrating the past we honor the 70 founding members who with $7000 in contributions built the building with their own efforts. 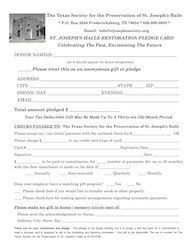 We likewise recognize St. Joseph Society whose leaders over the past century have dedicated themselves to the maintenance of this historic edifice. Throughout its 112 year history the Halle has been the venue for thousands of events, last year alone hosting over 320 gatherings. Because of its acoustics, it is the preferred venue for band, chorale and orchestra concerts. The rental calendar is replete with craft and art shows, wedding receptions, community, school and parish events. This constant use has been at a cost. The peeling paint, cracked wood and falling plaster are signs, that no matter how well built, the Halle has aged and needs restoration and renovation. 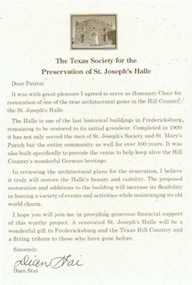 The Texas Society for the Preservation of St. Joseph's Halle has been incorporated, granted tax exempt status and will spearhead the restoration work. 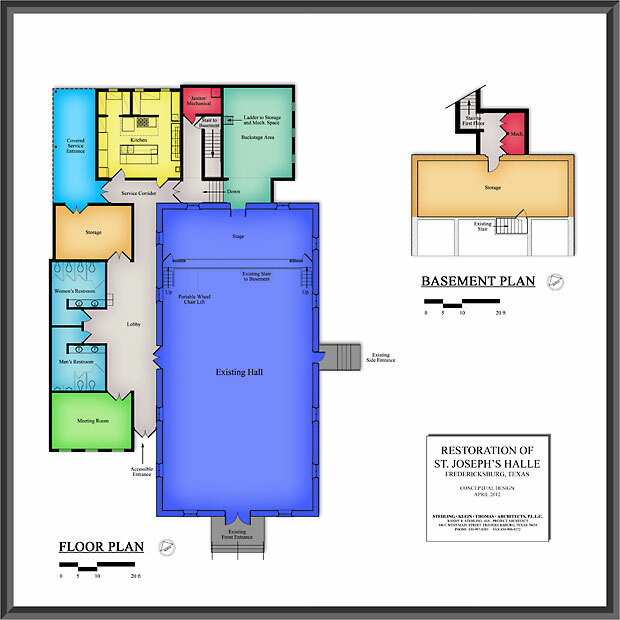 The plans for the project have been developed by architect Randy Stehling and approved by the Historical Review Board and the City of Fredericksburg. We now are starting the Capital Campaign for this historic restoration and renovation and ask for your support when the Capital Campaign contacts you. Please contact me at 830-669-2360 or carlos@beecreek.net for more information. 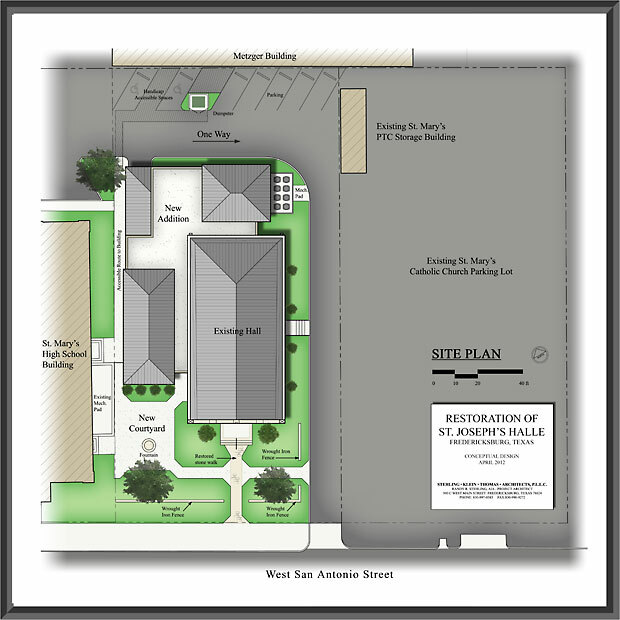 Send mail to webmaster@stjosephssociety.org with questions or comments about this web site.